No surprise with the weekend's No. 1 movie, right? After all, "The Hunger Games" must have made millions from all of my Facebook and Twitter friends alone, for how much I saw them talking about it. 8. “October Baby,” $1.7 million. This morning I sat down with onetime criminal Phil Christopher of Lyndhurst, subject of the new documentary "Superthief," and Tommy Reid of Los Angeles, the director-producer. The movie, based on the book of the same name by Lyndhurst Police Chief Rick Porrello, makes its debut at the Cleveland International Film Festival. Although I'll have a full story in the next week or two -- as "Superthief" begins runs in Euclid and Mentor -- I wanted to get the word out there for anyone who might want to head down to CIFF this weekend. Holy mackerel, what a stash! Michael Rorrer and his family recently hit the jackpot and it had nothing to do with playing lucky lottery numbers. The 31-year-old found a stash of old comic books in his great uncle's Virginia home after his death and the magnitude of that collection fetched the family millions. Included in that stash were Action Comics No. 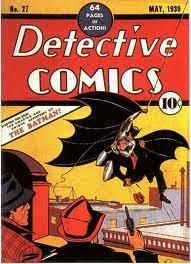 1 from 1938 and Detective Comics No. 27 from 1939. Anyone with interest in comic books knows the significance of these two issues. They're two of the most sought-after comic books in history, the holy grails of the industry. 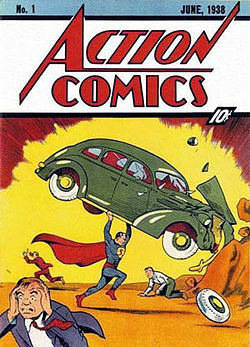 Action Comics No. 1 marks the first appearance of Superman, while Detective Comics No. 27 introduced the world to Batman. In early March, the collection brought in about $3.5 million at auction. "The scope of this collection is, from a historian's perspective, dizzying," said comics publisher J.C. Vaughn in a published report. Talk about a one-in-a-million find. Entertainment Editor Mark Meszoros, Sports Editor Mark Podolski and Community Engagement Editor Cheryl Sadler sat down to talk about a new movie, some new TV shows and some returning TV shows. The Shins, "Port of Morrow"
Follow us on Twitter @nhfeatures, @mpodo and @nhcheryl. A little earlier today, I took my talents to the Behind the News-Herald blog to write about a movie I can't yet write about. I'd love if you had a look. "21 Jump Street" got a mediocre review, but surely anyone who likes a) Jonah Hill, b) Channing Tatum or c) the television show "21 Jump Street" is certainly headed to theaters for this new release. Don't know if I'll see the movie, but it has made me want to check out the TV show, which I was too young to enjoy when it was on the air. 9. “Casa de mi Padre,” $2.2 million. March 25th can get here quick enough. 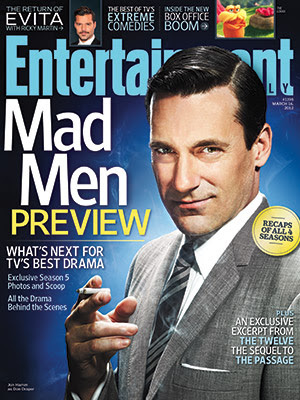 It's been more than a year since we last saw Don Draper and Co. in a Mad Men episode, 17 months to be exact. The wait is almost over. Season Five of the 1960s addictive AMC drama about New York's most stylish, most aggressive and most successful ad execs will return in a few weeks. What can we expect? Surely there will be plenty of boozing and smoking, boardroom meetings, as well as ... well, if you watch the show, you know what I mean. Donald Draper (Jon Hamm) likes his booze, his smokes and his women, but will he actually follow through on his marriage proposal to his former secratary? What about Betty (January Jones)? Something tells me we have not seen the last of Donald and Betty as some sort of couple. The answers and more begin to get revealed March 25. The four-time Emmy Award winning series has been away for too long. Don Draper, you have been missed. How crazy has the world revolving the launch of a new Apple product become? How nuts am I now about these things. This nuts: I'm bothered -- actually ANNOYED -- over the name of the new iPad. What's the name? That's it: the new iPad. Not the iPad 3 as we thought it would be for so long. Not the iPad HD "confirmed" by a number of tech sites in recent days -- and, for the record, a moniker I though made a lot of sense. After all, the new iPad, as expected, boasts a so-called Retina Display, Apple's branding for it version of a high-definition display. Already on recent models of the iPhone and iPod Touch, a Retina Display means the human eye can see the individual pixels at a distances of 10 inches or so. 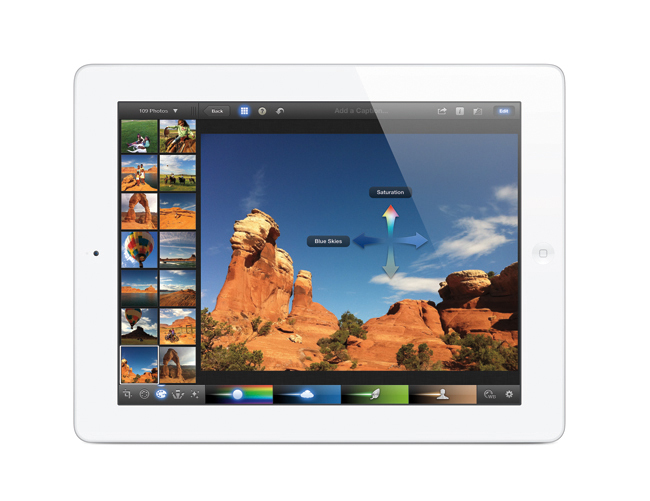 Above is an Apple press image showing the new iPad running the new iPhoto app. All in all, it's a nice update. But, seriously, simply iPad? Come on, Apple, you could have done better. You'll regret this ... when you're selling millions and millions of these things, beginning March 16. Things are starting to look a lot better for the year. And when I say "things," I mean musical things. And when I say "musical things," I mean concerts. And this morning brought more great news. Radiohead has added a Northeast Ohio show to its 2012 tour, bringing the intricate musicality of "The King of Limbs" to Blossom Music Center in Cuyahoga Falls on June 6. Reserve tickets are $69.50 and lawn seats are $30 -- before those lovely fees, of course -- and the tickets go on sale Saturday morning. Radiohead is playing a lot of newer material -- much of it on the mellow side -- on this tour, so it may not be for everybody. But the set list from Saturday night has me totally juiced. How fitting that a film based on a Dr. Seuss book lands in first place at the box office the weekend of Dr. Seuss' birthday. And it's nice to see that after winning the Academy Award for best picture, "The Artist" has made it back in to the top 10. 5. “Tyler Perry’s Good Deeds,” $7 million. 9. “Ghost Rider: Spirit of Vengeance,” $4.7 million ($6 million international). The trailer for "The Avengers" was released this week. I'm not sure what to think about it.